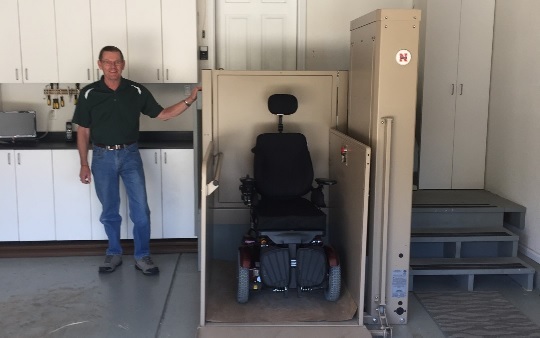 Accessible Systems, a business in Englewood, CO, is proud to announce that they have been working with a veteran who has recently been diagnosed with ALS. While his needs are not acute, his diagnosis is such that he will soon require adaptations to his home. "People heard about ALS through the recent 'Ice Bucket Challenge' that hit social media by storm," says Nathan Colburn of Accessible Systems. "However, most of the people who took part in the challenge or donated to the ALS charity still have little idea of what this illness actually means. We wanted to work together with Larry Harms, a veteran with a recent ALS diagnosis, to make sure he would be able to live independently once his illness progresses. As such, it was our personal Ice Bucket Challenge." ALS is a progressive neurodegenerative disease. It affects the various cells in the spinal cord and brain. This means that, over time, people lose their ability to move, speak, eat and, eventually, breathe. While there is no current cure for ALS, sufferers are living longer, particularly those who have prepared for their futures by making their homes accessible. When Larry Harms was diagnosed, he struggled to accept it. However, he now understands that his needs will change significantly over the next few years, and he wanted to prepare himself while he still could. As such, he has implemented a number of tools in his home. It is likely that he will soon require a power chair for mobility, which meant significant changes had to be made to his property, including to the entrance, patio area, stairs and bathroom. Furthermore, Mr. Harms wanted to make sure that he would still be able to enjoy certain things in life, such as the outdoors, and that he would be able to ask his community for support. "Larry is a very special man," adds Nathan Colburn. "He is a husband, a father, a grandfather and a friend. He is also a veteran who has done his part to serve and protect our country. We invite everybody to see how he has planned for his future in readiness for the time when he will need accessibility to his home." Mobility needs are varied and complex, and Accessible Systems has all the tools and experience to enable people to live comfortably. They offer their clients complete planning and guidance with stair lifts, euro style bathrooms, wheelchair lifts, ramps, lift and transfer systems, bars, railings and handholds, and other bedroom and bathroom equipment. They offer a completely free evaluation and estimate for any property so that people are able to properly plan for their own futures.